Water Warfare, known as Bang Bang Kids (バンバン☆キッズ) in Japan, is a comical first person shooter that uses water guns to battle and soak your opponents. Each map, a Playground, Beach, Plaza, or Nature Park theme, is generated automatically when the game is on, where you can think up new strategies each time you engage! Game modes include Single Player Missions, CPU Match, and 2-Player Split Screen. 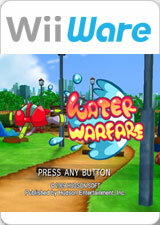 Soak your friends in this family-friendly first-person shooter! Go against up to 8 players online! The graph below charts the compatibility with Water Warfare since Dolphin's 2.0 release, listing revisions only where a compatibility change occurred. This page was last edited on 4 February 2019, at 03:51.